It’s been a few years since we first brought chickens home. It’s been an adventure. I have funny stories, I have sad stories, I have unexplainable stories. I love having chickens. I wouldn’t change that for anything, but having chickens is hard and easy at the same time. 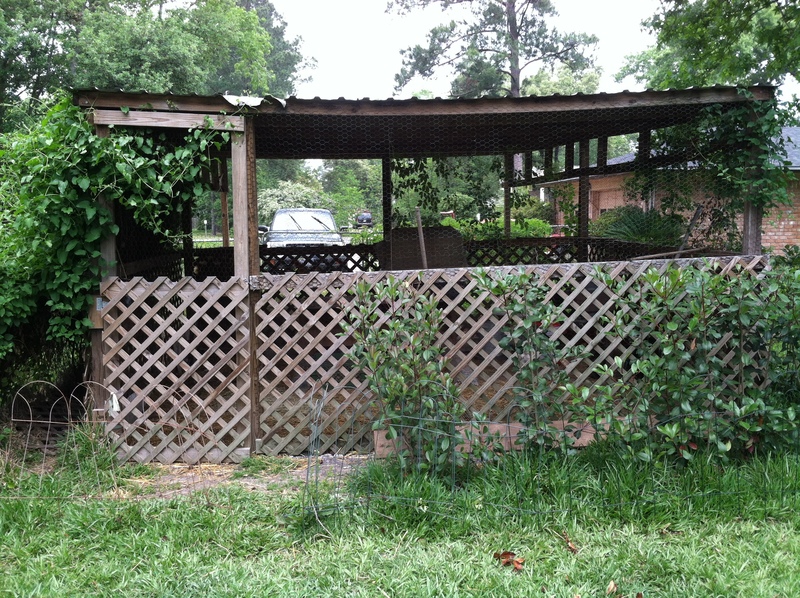 The big coop with vines added for sun protection and bushes for dog protection. 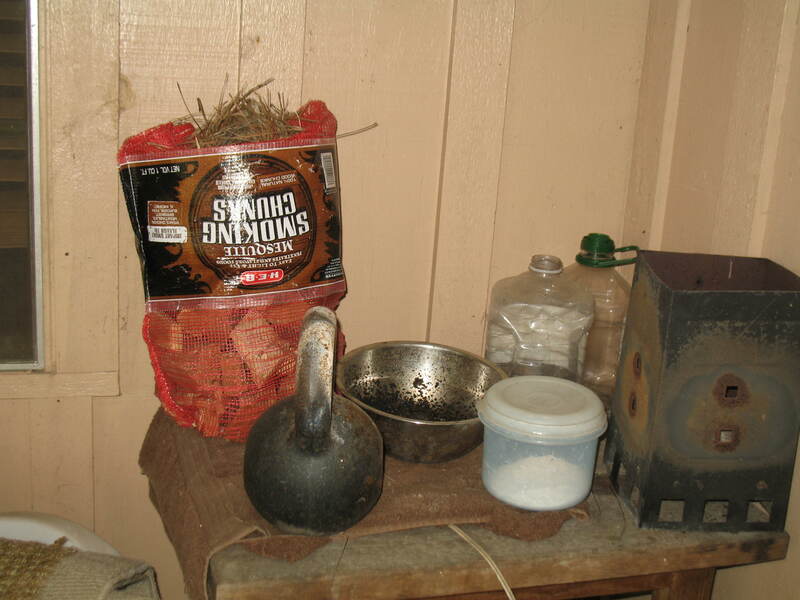 Inside with various stages of boxes, waterers, and feeders. It’s a learning process. This year I had the baby fluff itch and bought 10 new hatchlings in the spring. As odds would have it 5 turned out to be roosters, of the 5 hens only three made it to adulthood because our dogs got ahold of them. 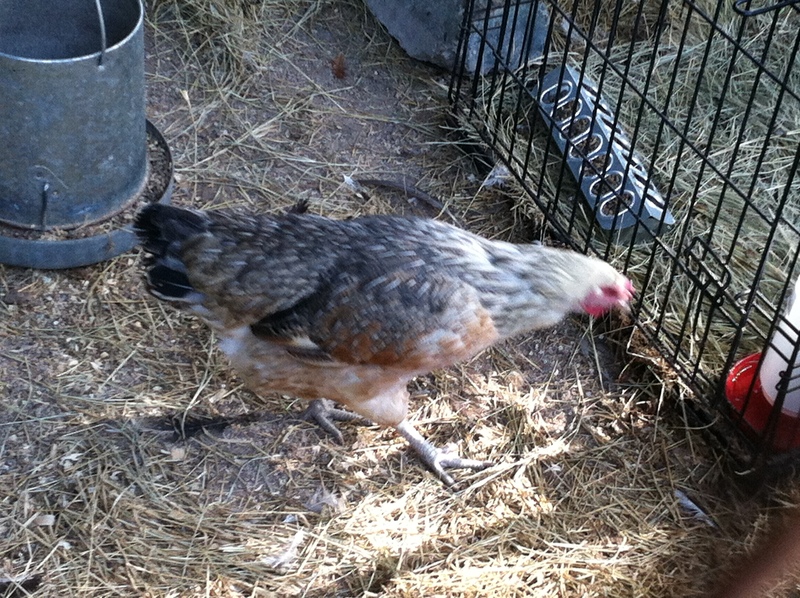 We decided this go round we would keep one rooster for potential breeding purposes. So a few months back when the crowing got to be too much and the roos were big enough (sort of) we slaughtered them and froze them for food. A lot of people ask if it’s difficult for us. My response is always that I know the chickens have had a good life and they’re slaughtered humanely. 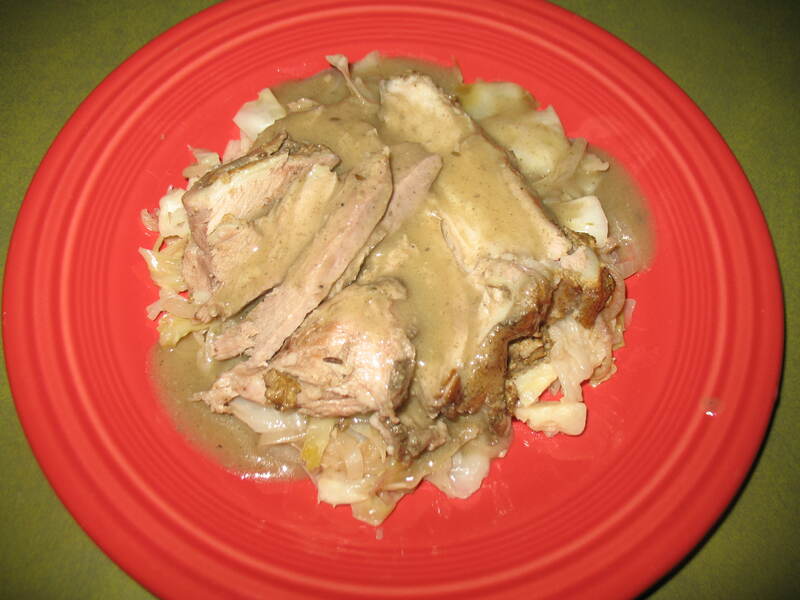 It’s a lot easier to kill a chicken than you’d think. The best advice I have for you if you decided to eat your chickens, is to never view them as pets. They are livestock. Over the years I had some chickens that I’ve become attached to and I was very upset when they died (illness or predator attack). But, the rooster and most of the hens are livestock to me. When it’s their time it’s their time. Well back to this year of chicken. 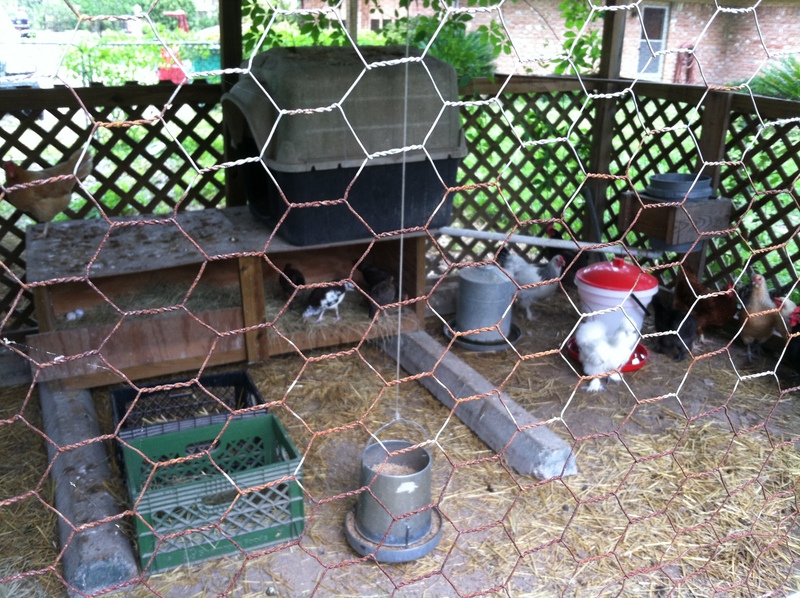 The rooster we kept, Doplh, was not very bright, and hen pecked, but we liked him in all his goofiness. He was kept because he had an excellent 80’s rock mullet of feathers and a comb over. This weekend he was acting strange, and died. I found him lying down and separated him from the ladies just in case he was sick. We really have no idea why he died, but have a theory about his crop being full. I disposed of him before I learned of this potential cause so I have no way of inspecting. So we are back down to just the ladies. 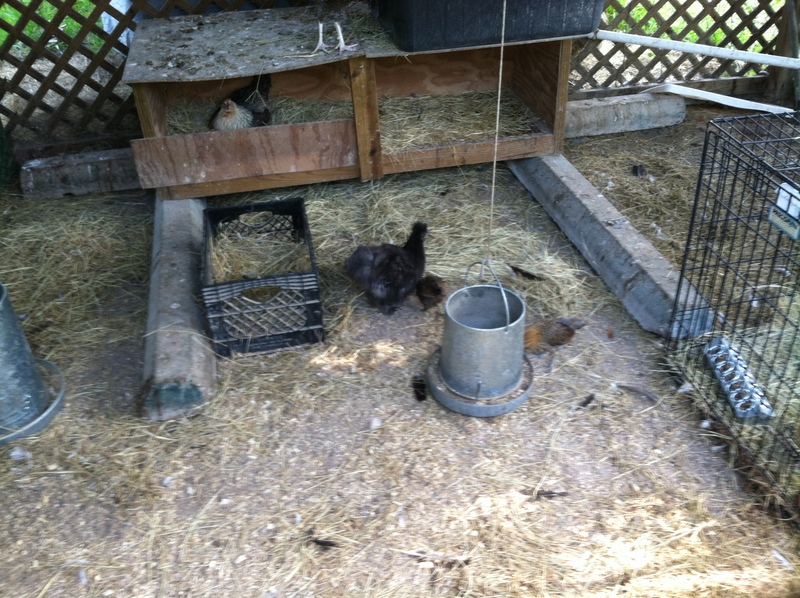 We also received 4 baby chicks from a friend a few weeks back. One of them died, and we were worried it was coccidoisis, however, it never spread to the other chickens so I’m unsure why. We only learned of the potential of cocci after they had been introduced to the main flock. The friend who gave them to me also lost a few of her babies, and we both observed bloody stools. Typically if there is a risk of it you want to quarantine quickly, but since all the remaining flock appears to be healthy we’ve left them together. Unfortunately the baby drama doesn’t end there. One of my broody hens, Jack, attacked one of the babies and nearly killed her. So Jack and the baby have been in quarantine for the last week. Jack has received a lot of submissive training because she decided to start attacking me too. After a week she seemed to calm down quite a bit and has been slowly reintroduced back to the flock. During her time in lock down she started picking out her feathers, so I worried she was stressing too much and actually moved her jail (dog kennel) inside the big coop. Now she seems okay, but we’re watching her aggression. 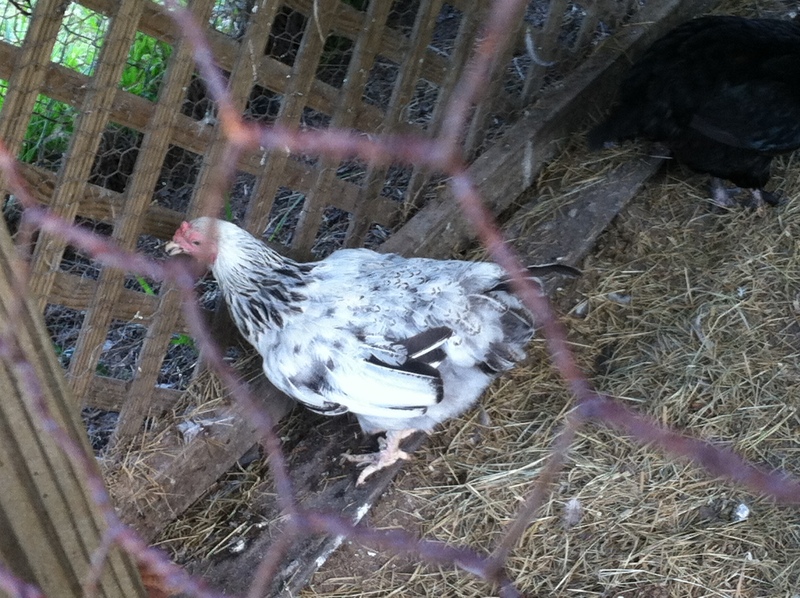 The baby she attacked is a survivor, so we named her Gloria Clucker. She has healed well but is still recovering. 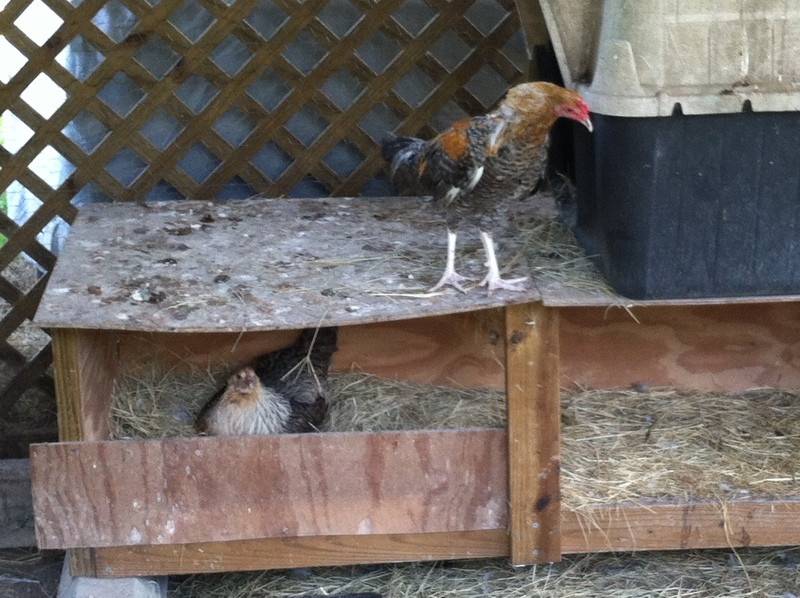 I’ve moved her out of quarantine in the garage and back into the coop. She is not yet ready to be part of the big flock yet but hated being alone so she is in the dog kennel that Jack used to be in. I told T recently that after all this craziness, we’re not getting any new chickens for awhile! We are currently at 10 large hens, and 3 babies. Below are the pictures of all the ladies with a quick introduction to their personalities. Not pictured are Dusty Chickenfield and Snowflake, they’re part of my March babies, and are super fast! They’re small game chickens and not very personable closer to wild birds than the friendly livestock nature of my others. T-bone and the two babies- T-bone is my smallest full grown hen, she’s a silkie about 1.5 years old, and she’s adopted the two easter egger chicks as her own. Jack out of lock down, minus some feathers- she’s incredibly broody, recently aggressive towards people and chickens, in training to hopefully fix her of that. Bandit- smaller black and grey hen. one of the head ladies, decent layer, friendly Big Red- she and bandit are in charge and often found together, Red comes running every time she sees me because she knows I bring the kitchen scraps. Red is one of my oldest ladies. 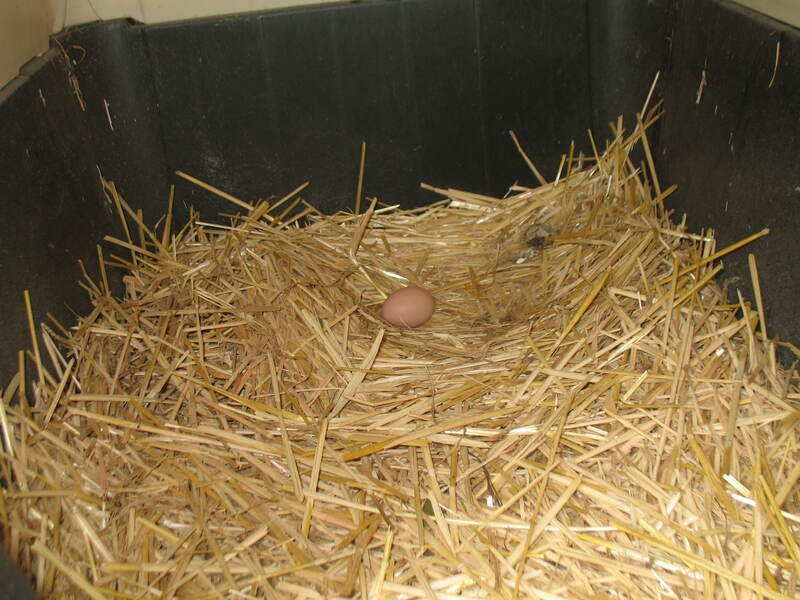 Monday- shy, large egg layer, stays to herself mostly. 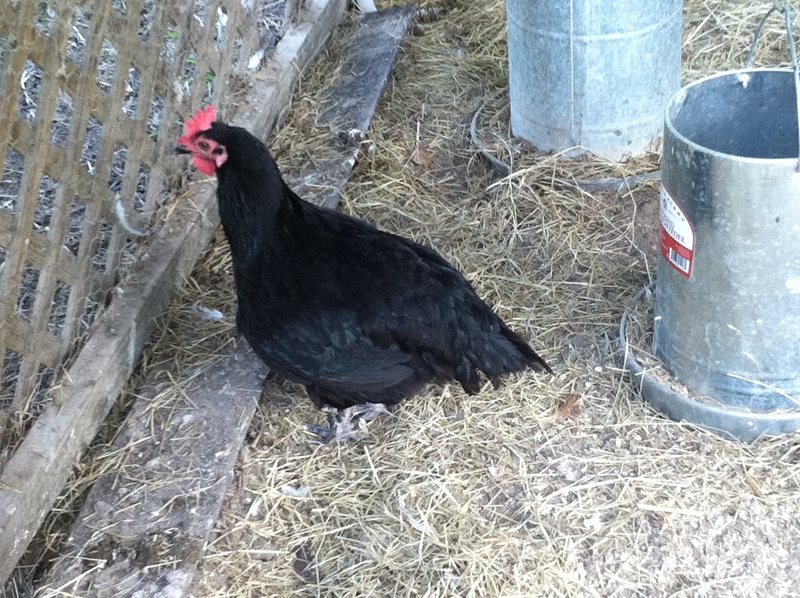 Castor – Pollox’s sister, likes to catch lizards, more dominant and less broody than her sister, very noisy hen. Gloria Clucker- She’s a survivor! 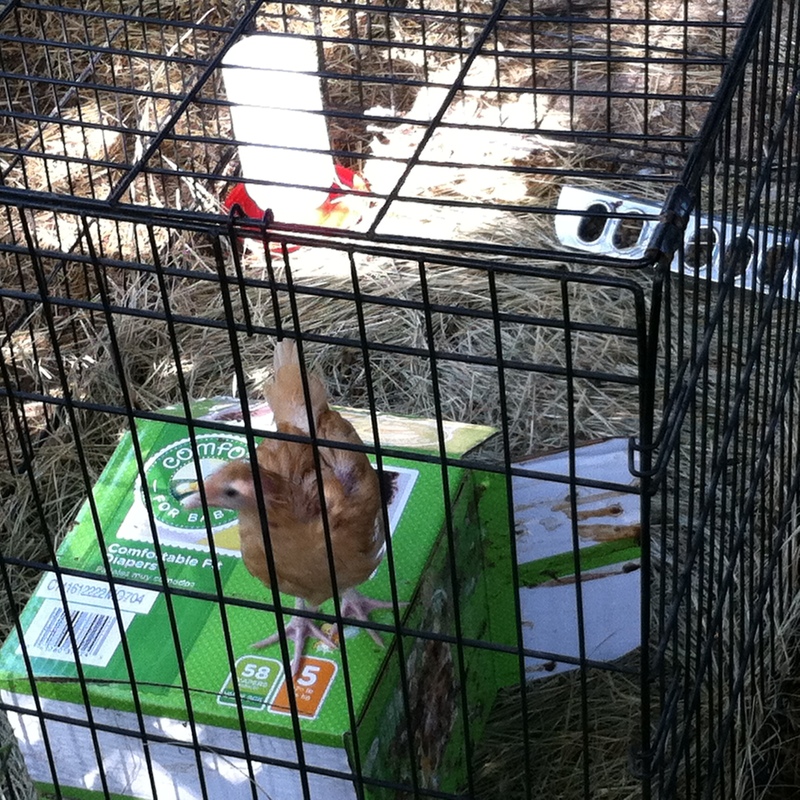 She is a buff orpington, pretty tame, and recovering very well. Finally the terrible eat beasts! 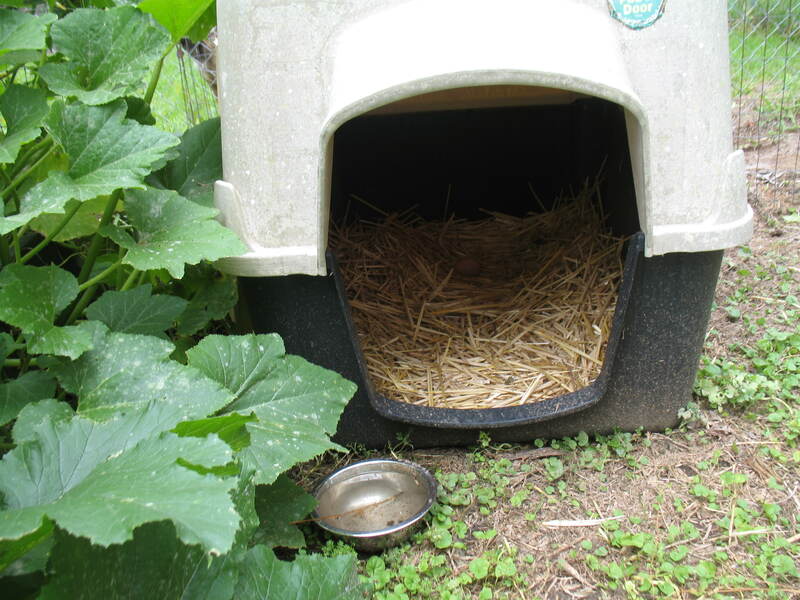 Despite every enhancement we make to the coop to dog proof it, they find a way to get a couple a year. To be honest sometimes it’s our fault for not double checking the count and finding the chicken before letting them out. 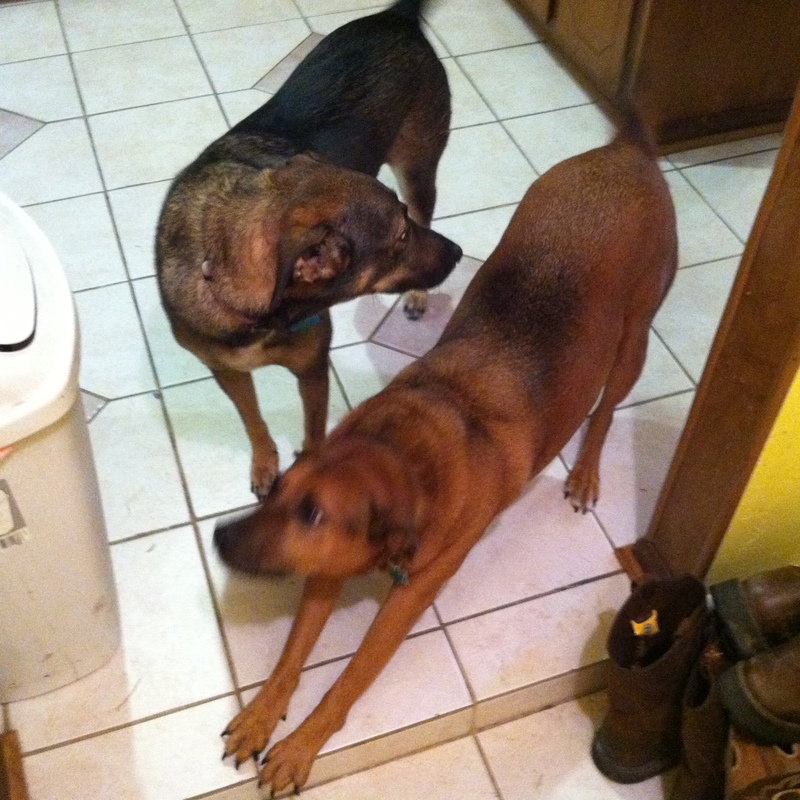 Dagney and Roark- We eat mommy’s chickens! It’s a long one but so much is happening on the chicken side, I had to update. Keep an eye out for the next one. So Friday is posted late. We had girl’s day on Friday and then I got caught up in my weekend. 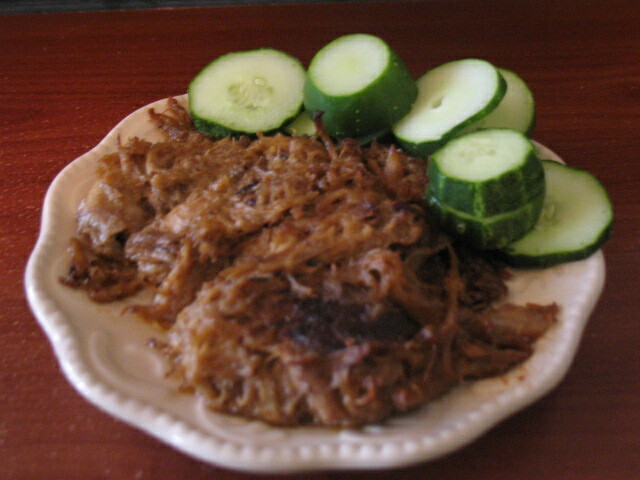 I kept mostly paleo on Friday. I ate a normal breakfast cooked by the lovely T.
For normal maintenance I don’t recommend replacing 2 of your meals with protein. However, on a night like this it was perfect. I didn’t crave a hamburger late night, AND I had plenty of energy to dance. 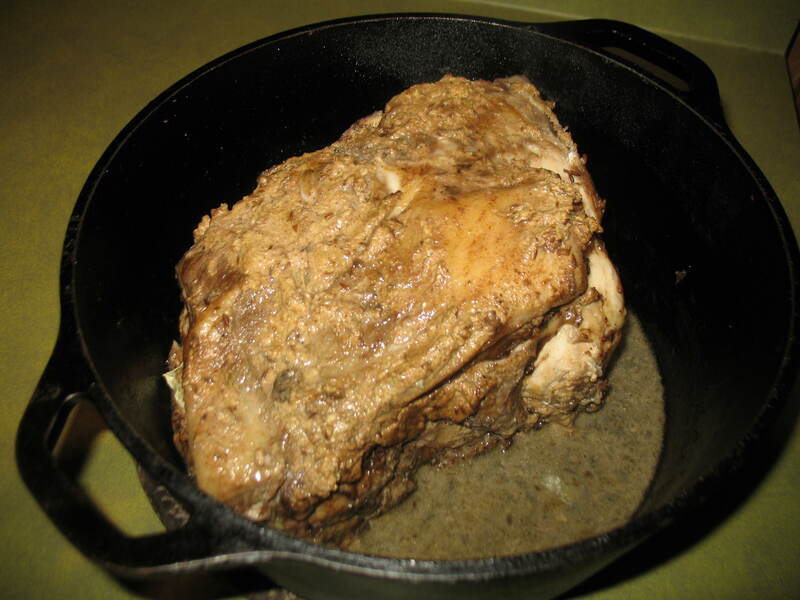 I have several friends that are new to paleo eating. 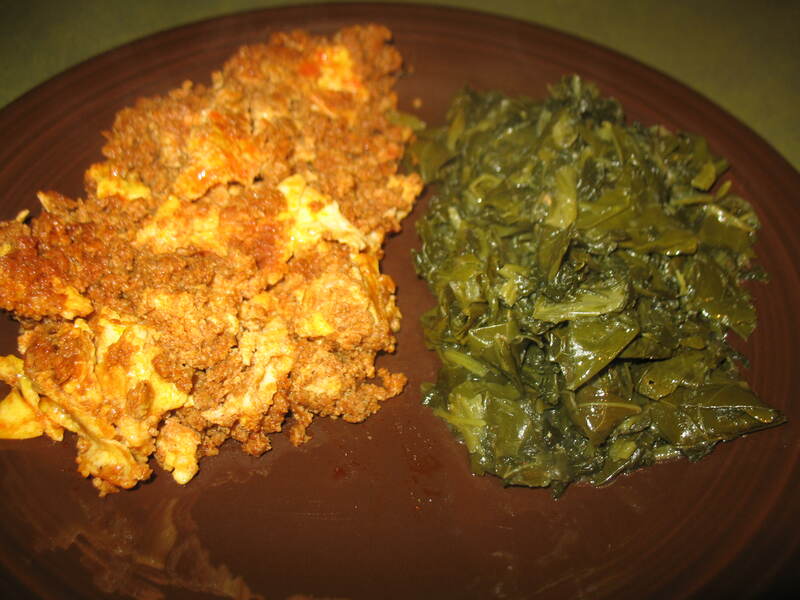 In honor of them I will be posting my meals for each day. I usually eat twice a day with tons of water in the middle. 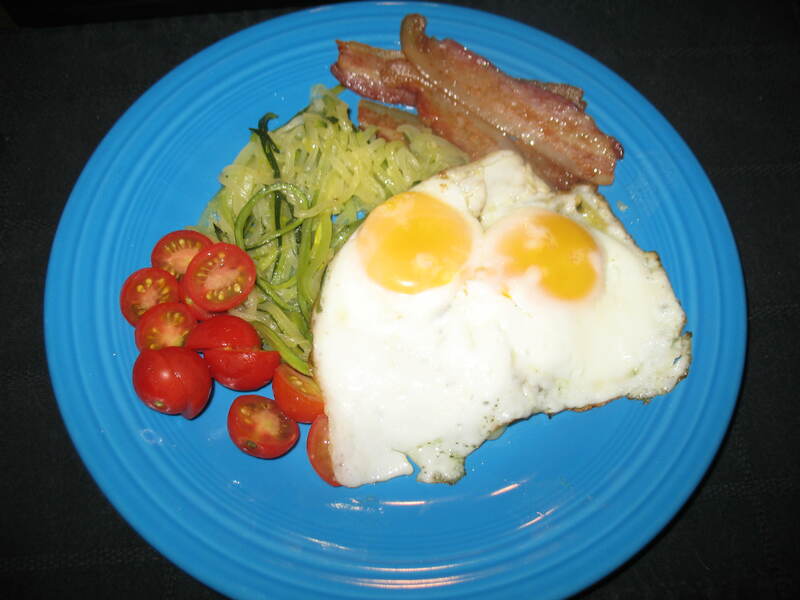 I had leftover zucchini noodles from meatballs last night so I thought they’d make a good breakfast. 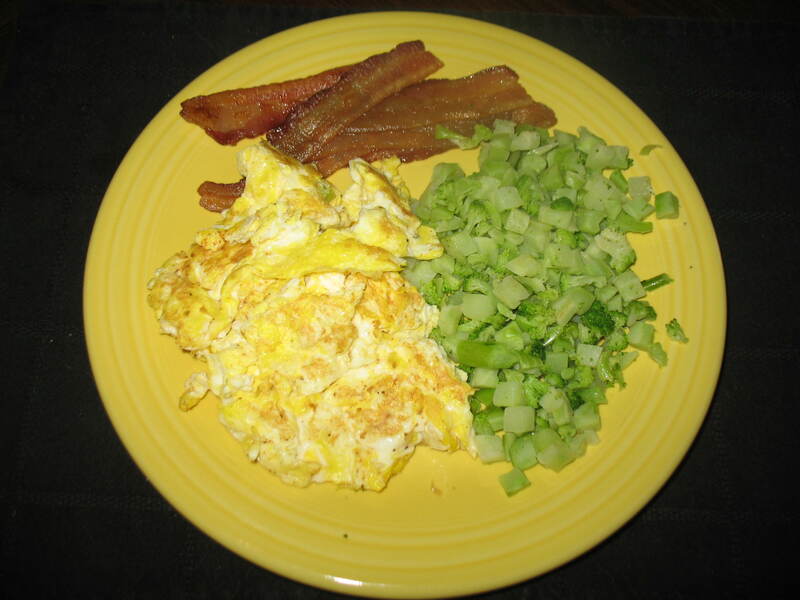 I served that with two eggs, some tomatoes from the garden and bacon. 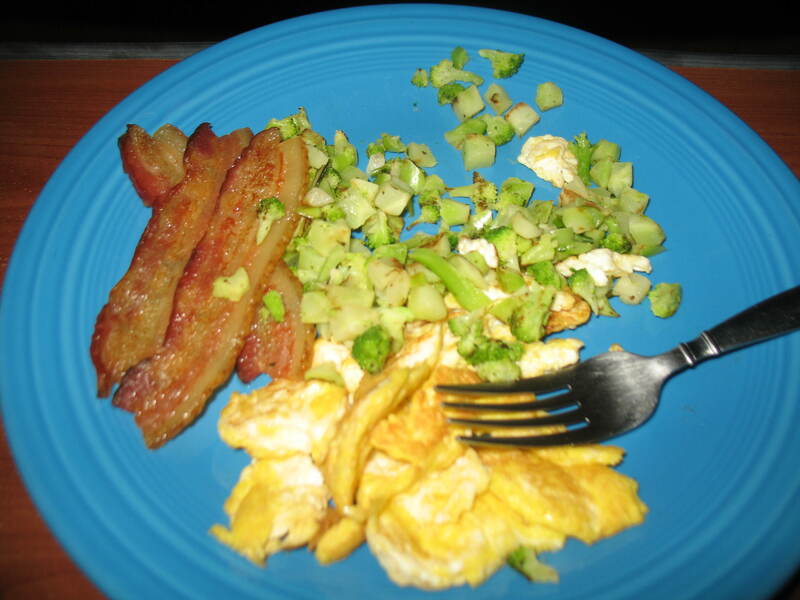 I made extra bacon and had a few slices as a snack in between. The unfortunate theme of dinner was “oops I burned it!” The cabbage and the chicken are both a little toasty. 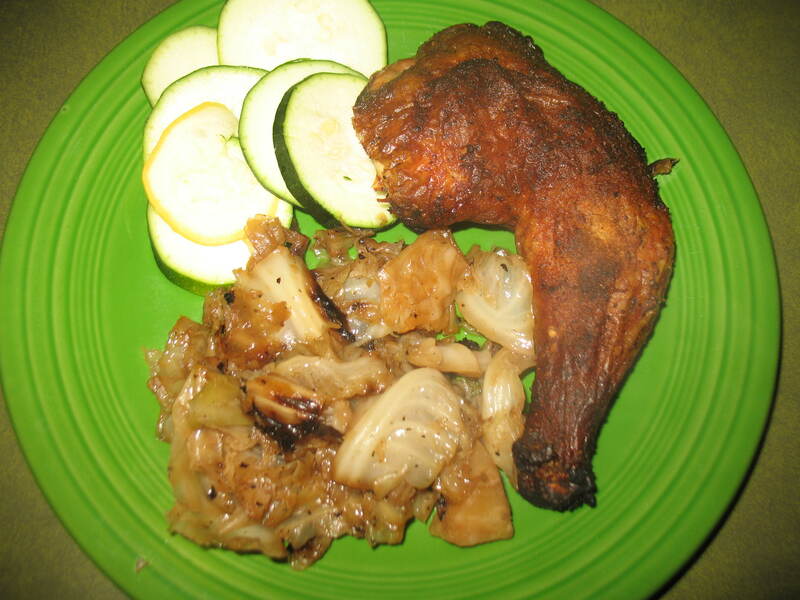 I had grilled chicken, braised cabbage, and raw zucchini slices. Again all the vegetables are from the garden. I also had a few raw unsalted cashews, and a glass of kombucha (fermented tea) but that would make for a boring picture so I didn’t take it. 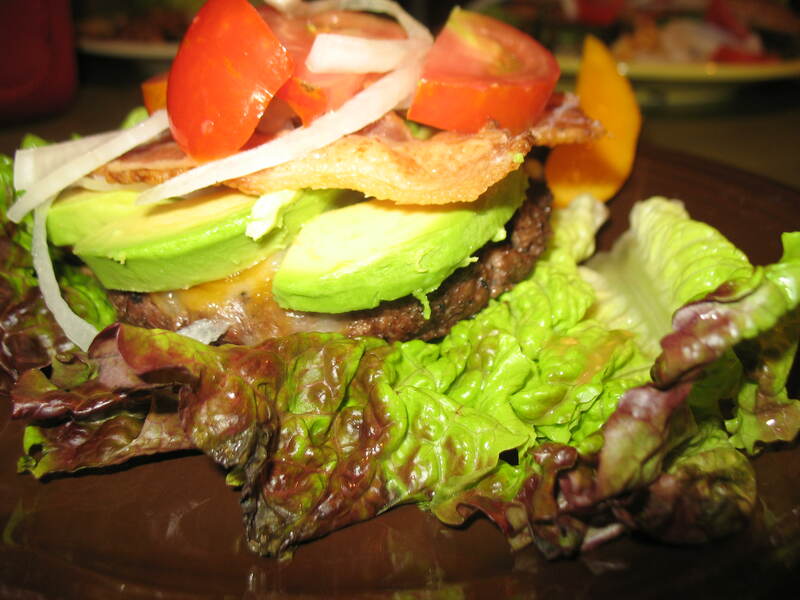 I hope that by posting my daily meals I can help inspire a few of you to try paleo too. It’s really not that hard. One of the biggest suggestions I have right now is to stop trying to find substitutes for your favorite grain food. 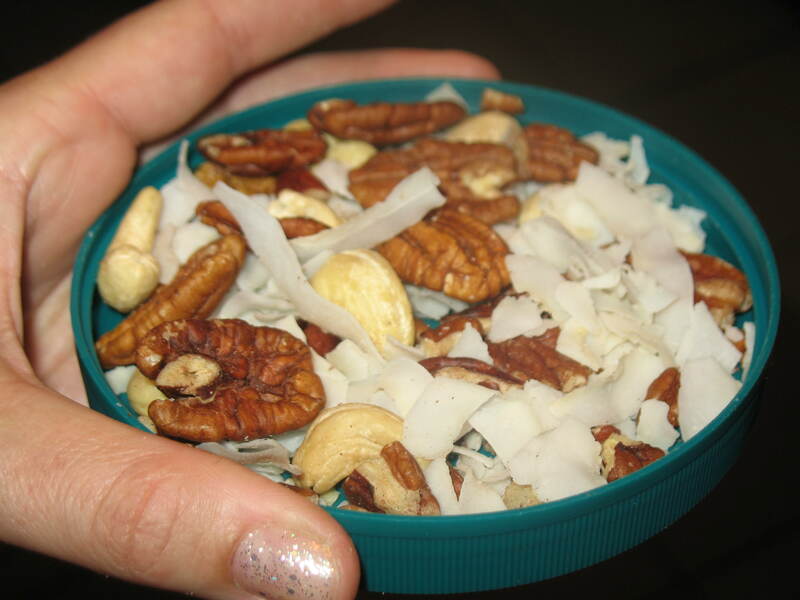 Don’t look for a paleo bread or muffin. 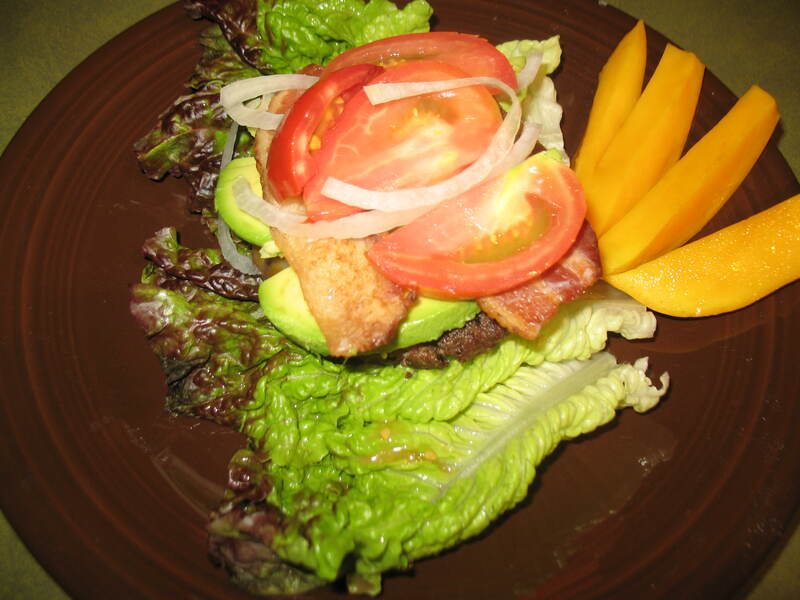 Instead think about making meat and veggies the star. Up there for I mentioned that I use leftover zucchini noodles. I just take a whole zucchini and peel it with a juiliane peeler. So we’ve had Lola the chicken for a few weeks now. She is almost always laying an egg a day. She is pretty happy with the set up in the garden. My dogs are dying to eat her, and tell me so on a daily basis. Thankfully they cannot get into the garden area and their whining doesn’t seem to phase the chicken at all. T remarked the other day that he never thought he’d shout the phrase “Dagney quit harrassing the chicken!” so often in his life. Currently Lola has an old dog kennel to lay eggs in and roost on top of. 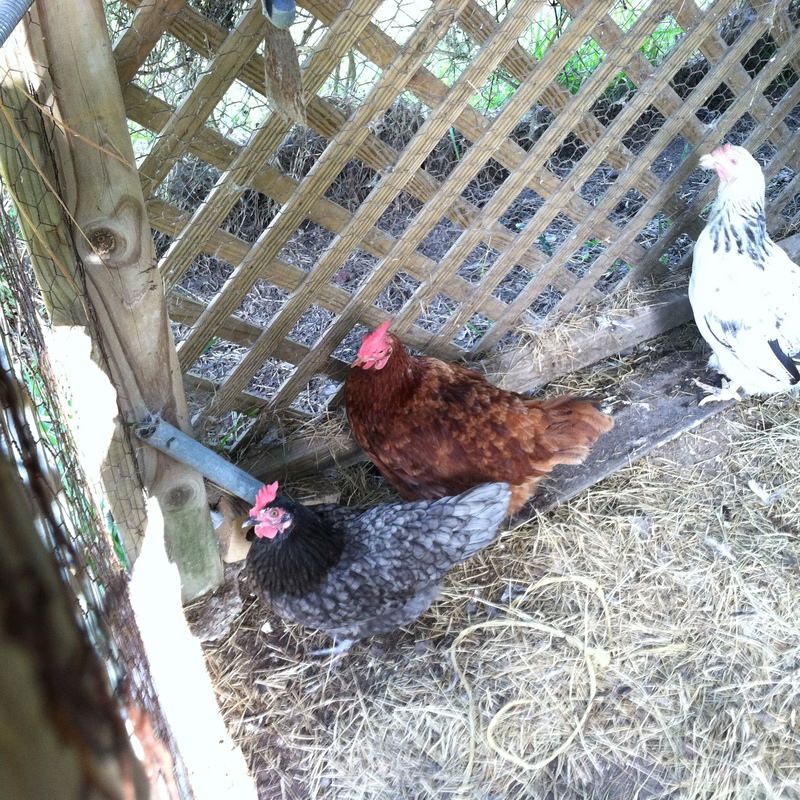 But, we’ve decided that we are going to build a chicken area and get a few more gals. I thought keeping chickens would be more time consuming or troublesome. But so far it’s super easy. I throw a bit of feed out twice a day and that’s it. 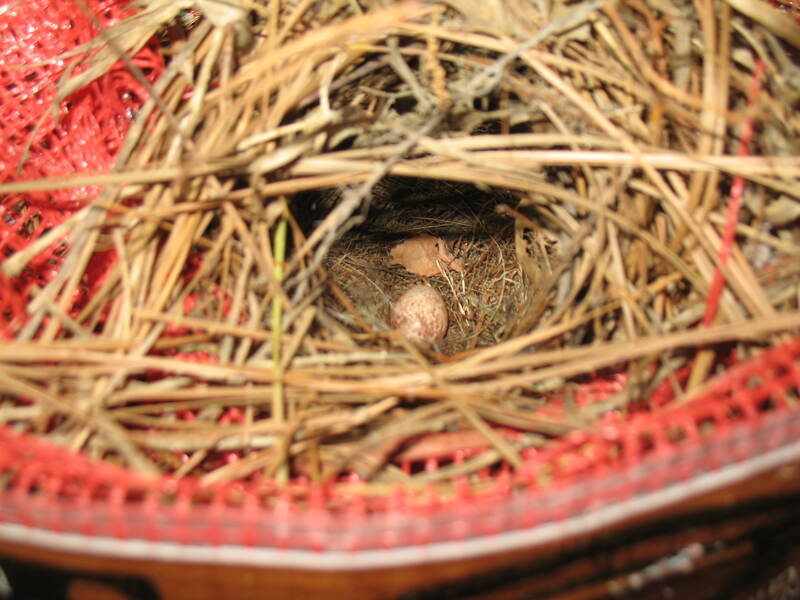 Speaking of egg laying birds I found this little nest on my porch. It has a teeny tiny brown speckled egg in it. It’s so cute.I hope it hatches so I can see the itty bitty baby! Finally, be jealous of my daily bounty. This is what I harvested today. At this point I’m giving a lot of vegetables to friends because I can’t keep up with eating it all. 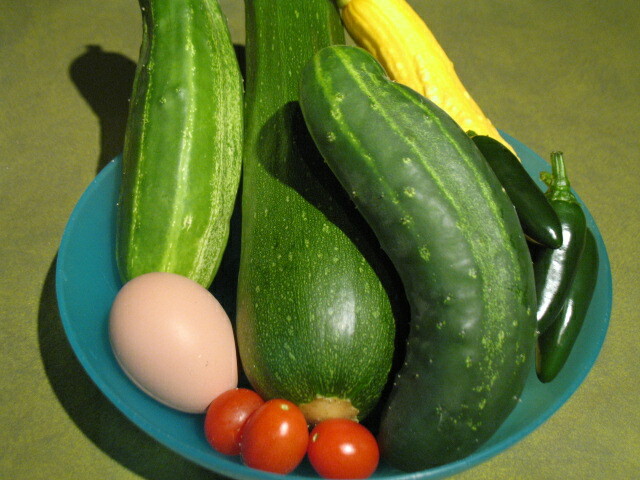 I love having homegrown veggies in my house.